A stuffy nose can have over 20 different secondary or lifestyle causes including diet (mainly sugars and starches or carbs), allergies, stress, a lack of exercise, poor sleep habits, and so forth. – Too much sputum or mucus (caused by cold or flu, hay fever, or an allergy). – Tissue overgrowth (this can happen due to deviated septum, nasal polyps, empty nose syndrome). – Stress, anxiety, and autoimmune reactions or allergies (since these factors increase minute ventilation and causes lower CO2 levels triggering vasoconstriction and reduced blood circulation in all tissues of the body, sinuses and the head included). 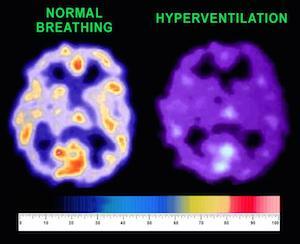 The image above actually shows oxygen levels in the brain (and sinuses too). One minute of deep breathing (of hyperventilation) reduces blood flow or brain circulation and brain oxygen delivery nearly 2 times! This happens due to losses in CO2 that is the most potent known dilator of blood vessels (vasodilator). This is in fact the key reason why people faint due to overbreathing in 2-3 minutes. Chronic diseases make heavy respiration at rest even worse: people start to inhale and exhale too much air, up to 2-3 times more than the medical norms. These are the reasons why various conditions, and rhinitis or hay fever as well, can lead to the blocked nose. It is not a surprise too that headaches can often coincide with more nasal congestion, especially at night. Too deep respiration constricts blood vessels due to CO2 losses. Even Wikipedia does not know these simple facts. The video below explains the key physiological cause and the best remedy that helps to get rid of problems with sinusitis or nasal congestion very quickly or in less than 1 minute. You can find more details about the best remedy for your stuffy nose here: stuffy nose home remedy.